What is LINX reflux surgery? If you have had a positive diagnosis of gastro-oesophageal reflux disease (GORD) or laryngopharyngeal reflux (LPR), there are a number of treatments available to you. These can include medication and lifestyle modifications and surgery. Surgery is usually only recommended in cases of reflux disease that fail to respond to other treatments. In recent years there has been an increase in the number of surgical procedures available – here we look at the LINX Reflux Management System. Reflux disease often results from a weak or damaged stomach valve called the Lower Oesophageal Sphincter (LOS), which allows stomach contents to reflux into the oesophagus. The LINX System is a small flexible band of interlinked titanium beads with magnetic cores which is implanted or wrapped around the weak or damaged LOS. It is designed to keep it closed to prevent stomach contents refluxing into the oesophagus, while at the same time opening to allow food to go down. What happens when I eat? The magnets will keep the LOS closed to prevent reflux but will temporarily open when you swallow food and drink or when you burp or vomit. Most patients say they are able to resume a normal diet within days of the surgery. The LINX System is placed around the oesophagus just above the stomach through a laparoscopy or keyhole surgery. Patients are usually placed under general anaesthesia and the abdomen is accessed by four incisions and inflated by gas usually in a procedure that takes less than one hour. Watch this video of LINX surgical footage. In the UK, availability of LINX on the NHS is currently limited with the price for private treatment in the region of £8,000-£9,000 – for example, the Reflux Centre charges £8990. In the US, surgery tends to cost between $12,000 and $20,000. You can find a local centre in the UK here. The LINX reflux management system uses permanent magnets that are designed never to wear out. Patients have reported improvements in heartburn and regurgitation symptoms, many are able to stop taking reflux medication and many are able to resume a normal diet following surgery with minimal side effects. One LINX study says 87 per cent of patients were reported to be satisfied with their symptom relief at one-year follow-up and 86 per cent were satisfied at two-year follow-up. In May 2017, data from the Caliber trial, presented at Digestive Disease Week, found that the LINX device was more effective than proton pump inhibitor therapy for treating regurgitation in patients with GERD. Read Garry’s story – he had LINX surgery after a positive Peptest confirmed he was refluxing. 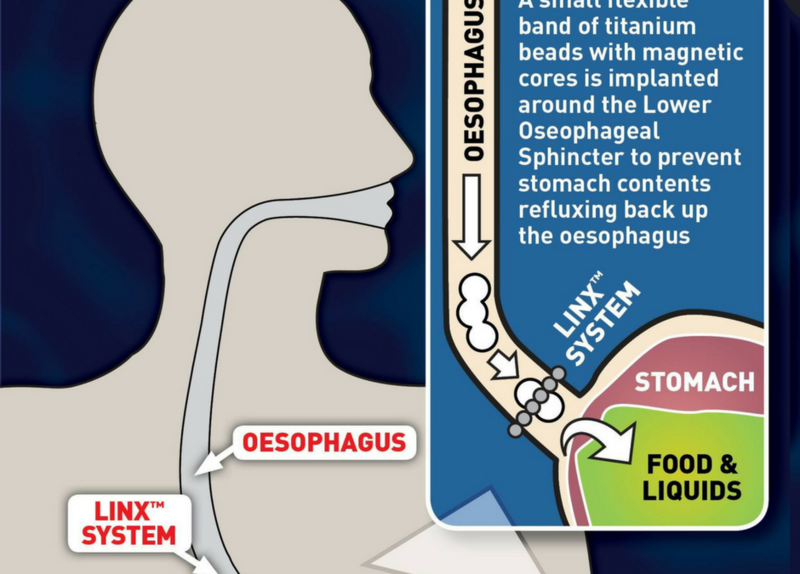 A clinical study of 100 patients found that difficulty swallowing (68 per cent), pain (24 per cent), and stomach bloating (14 per cent) were the most common problems associated with the LINX system. Other risks of the LINX System reported less frequently included hiccups (eight per cent) and nausea (seven per cent). In most cases, the side effects were mild and resolved by three months after the procedure. A study in June 2017 found that during a 4-year period in more than 3000 patients, no unanticipated complications have emerged, and there is no data to suggest a trend of increased events over time. Is it heartburn or indigestion? Carol Torssell on What is Laparoscopic Nissen Fundoplication reflux surgery?